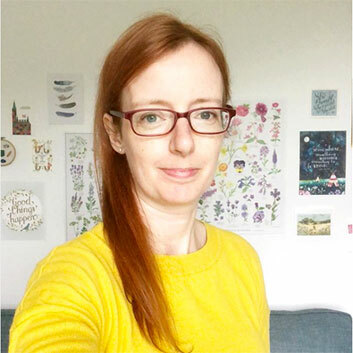 I’m so pleased to bring you the next in my Live Your Best Life series, an interview with Lowri Harris who runs her own online business, little maldod, while raising her two children in south Wales. Hello, I’m Lowri, wife to Sam and Mum to our son (Wilfred) and daughter (Anwen). I’m also the owner and founder of ‘little maldod’, an online shop for little ones, their mums and happy homes. I had always dreamed of having my own business and running something that would satisfy my creative soul, but it took a few years of drifting from unfulfilling office jobs before I finally took the leap. When I returned to work after having Wilfred, I knew deep down that I wouldn’t be happy in the bureaucratic, dry office job that I was doing. I vividly remember a conversation with my sister who told me to “STOP talking about it and just do it!” It was the kick up the backside I needed to just start. I was pregnant with Anwen at the time and when the opportunity to take voluntary redundancy coincided with my maternity leave, I grabbed it with both hands and haven’t looked back. That was a little over three years go. I’ve since built up little maldod into a shop which stocks my own products as well as those from other independent makers and designers. I also write a blog alongside the shop with bits of creative inspiration and stories of our family home life, adventures and tales of seasonal living. Juggling motherhood along the way hasn’t been an easy task, that’s for sure, and I sometimes reminisce on those quiet office days but I wouldn’t change the way things are for anything. I love a good quote but have a terrible memory so always forget them! Anything that encourages spreading kindness and smiling always inspires me though. As a Christian, I find that that my greatest inspiration comes from snippets of scripture. There’s a proverb in the bible about ‘The Wife of Noble Character’, it describes a woman who is kind, strong, capable and creative and who provides for her family who love her. There are so many nuggets of inspiration in the lines of that passage which I find hugely inspiring as a wife, mother and business owner. What are the warning signs that life’s getting on top of you? I find myself getting irritable and get over anxious about little things. I also have a recurring dream that I’m back at school and have missed an important exam or coursework deadline. It’s always a relief to wake from it! How do you get back to how you want to feel? My first reaction is to talk things through with Sam. I often find that talking things through and verbalising a problem is the first step to working through it. I also find that taking some time alone to prayerfully reflect on the things getting on top of me, helps me to refocus and get a better perspective. As a mum of two young children, finding this time can be easier said than done but going for a run or having a long hot shower (my preferred option at the moment!) always gives me a good chance for time to myself. I’d love to see my business grow and to introduce my customers to new independent brands and products. Working with, and learning from, other business owners has been a massive bonus in my journey so far and I’d love to see those new friendships develop. I have really loved writing my blog over the past year too and am working on my photography, so would like to develop this part of the business as well. On a personal level though, my hope is that I’m able to do this whilst striking a good balance in my home life. As much as I want to grow my business, I want to savour the time bringing up our children. I want to continue to build a home with Sam where the kids can grow up feeling loved, inspired and encouraged to be who they are. Building a loving and welcoming home is something that’s really important to Sam and me and, long term, we dream of having a space in the countryside which will nourish, inspire and give rest to all those who visit. That’s much further down the line but we love daydreaming about it together! And finally, Lowri, what does living your best life mean to you? To me it means loving those around you and spreading kindness in whatever small ways you can. If I can do that creatively through little maldod and through building a loving, welcoming home then I’ll feel like I’m on the right track. Lowri’s shop, little maldod, can be found at www.littlemaldod.com and you can visit her blog here. You can connect with her on Instagram, Twitter and Facebook, she’s a sociable soul so do go and say hello!